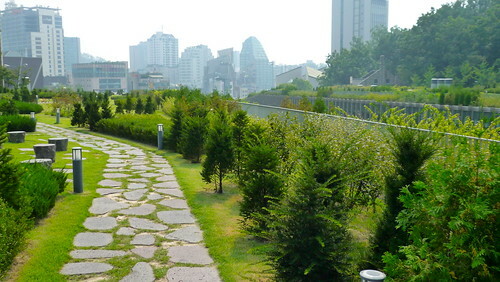 Seoul is not known for it eco-friendly building designs, but a couple of buildings I encountered recently, which have significant green roofs, have made me thinks that there may be hope yet for this city. A green roof is a roof of a building that is partially or completely covered with vegetation and soil, or a growing medium, planted over a waterproofing membrane. 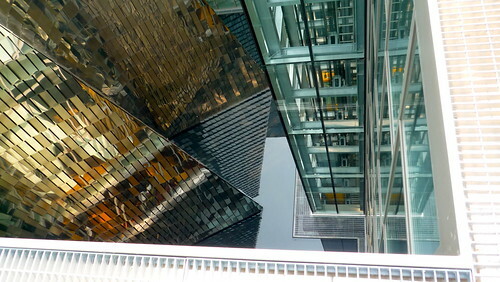 This does not refer to roofs which are merely colored green, as with green roof shingles. The best known green roofs are Chicago City Hall, The GAP Headquarters and Ford Motor Company’s River Rouge Plant. Yesterday I visited the new offices of Daum Communications, the distant-second-but-nicer-place-to-work Korean portal site (#1 is Naver.com). 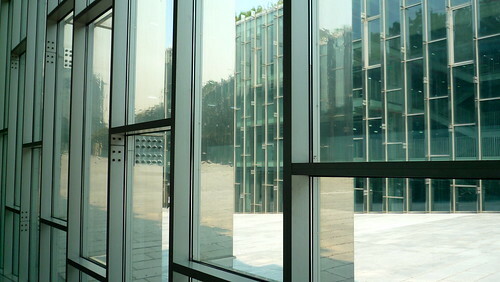 It is housed in the newly completed Ilshin building in Hannam-dong which is also the home to the Italian embassy. On the roof of the building I was surprised to discover a green roof. 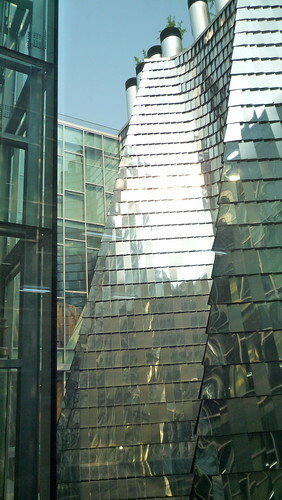 The chairman/CEO of Ilshin Spinning, Kim Young Ho, the building’s owner, is no stranger to design and architecture, having graduated with an architecture degree from Pratt in NY, and served on the board of the Korean Institute of Architects and also know for his formidable modern art collection. The anecdote recounted by one of the Daum staff was that he delayed the opening of the staff cafeteria on the 2nd floor of the this building because he was not happy with the design of trays. 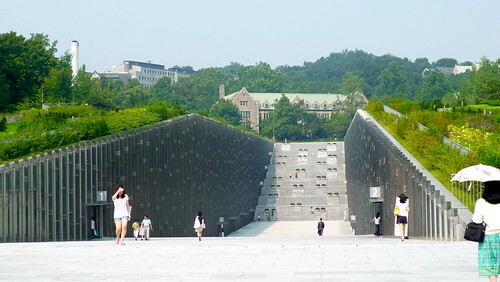 A couple of weeks ago, I found myself at Ewha Womans University (Note: “Womans” is not a misspelling), one of the oldest and most prestigious universities in Korea. 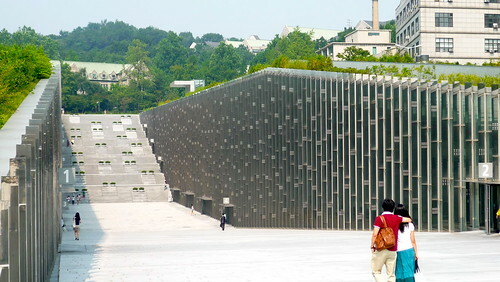 I was very impressed by their recently completed the Ewha Campus Complex, which was designed by French architect, Dominique Perrault. The building itself unnoticeable at first glance since it is half buried in the ground, but this makes for an impressive green roof. 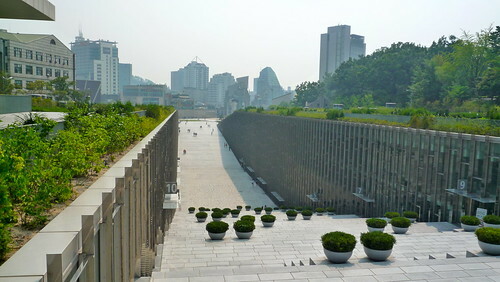 Ground was recently broken for Dongdaemun Design Plaza, which replaces the aging Dongdaemoon Sports Complex. 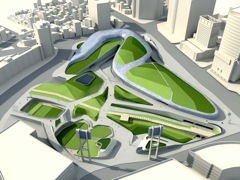 The London-based architect Zaha Hadid was awarded the commission following an international competition. 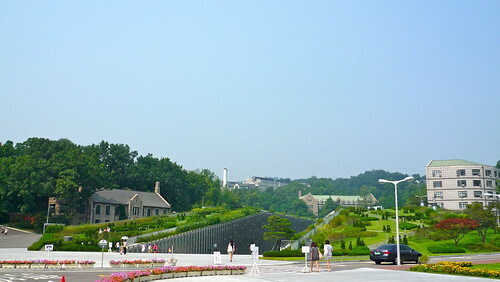 The most prominent feature of the design is its fluid surface green roof that weaves and connects the various part of the design. This all makes me miss Korea a bit. I arrived there in 1995 where the company accountant complained that as the #2 man in the company, that I had one more telephone line than the President. And each line cost $15 a month. 1 for the phone. 2 for the mechanical tape answering machine. And 3 for this new-fangled thing called ‘The Internet’. My how Korea has changed – for the better. I have lived in Korea for the past few years, I feel spoilt at all the technology but still find places where technology has not help at all. Education is one of those areas where my 9-year old is learning MS Office in school as opposed to all the wonderfully creative ways that computers can be used in the classroom. Hope you have a chance to come back soon.